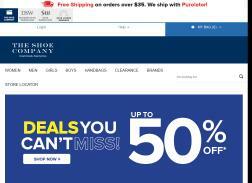 Online retailer of men's and women's shoes and other fashion accessories. Get 3x Shoe Lovers Rewards points on any PUMA purchase. Limited time only. Find your favorite style at the lowest prices. No coupon code required. Get up to 50% Off Clearance Athletic Styles. Some exclusions apply. Save up to 50% on clearance items. Some exclusions apply. Get updates about new product arrivals, special offers & promotions when you sign up for emails. Get free shipping anywhere in Canada with your free shoe lovers rewards membership on orders over $35+.